For those who don’t keep these ingredients on hand, I’ve provided a list of substitutions below the recipe. *Although I’m all for saving money, I recommend fair trade quinoa because the commodity market has had unintended negative consequences on Bolivian farmers. Dump everything in the slow cooker. Cook until soup is hot – about 2 hours on high or 3 hours on low. Serve on its own or sprinkled with chopped avocado. For cooked grain, substitute ½ to 1 cup dry millet or quinoa plus 1–2 cups water or broth. 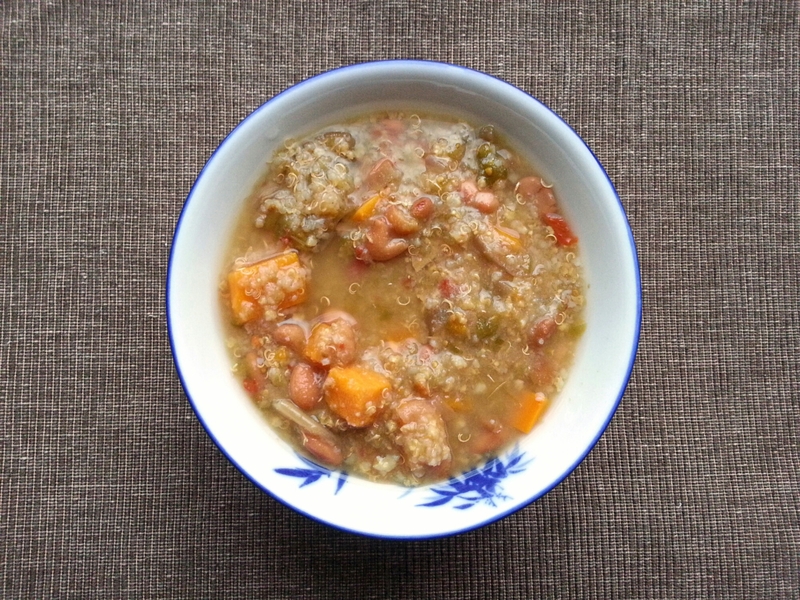 For cooked beans, substitute canned OR 2 cups soaked beans plus 2–3 cups water or broth. Extend cooking time until beans are tender – about 4 hours on high heat or 5–6 hours on low heat. For caramelized onions, substitute 1½ cups chopped onions, sauteed for about 5 minutes. For salsa, substitute 1½ cups fresh tomatillos and ½ cup sweet red pepper, diced, plus 1 clove minced garlic and 1 teaspoon ground coriander. For veggie broth, substitute water or poultry broth.